The plan unfolds slowly! Made arrangements for sale of the Nik, yesterday, and arranged to purchase a Dino Baffetti, Tex-Mex II/34 from the Button Box. As it happens, both the buyer of the Nik and the Button Box are right near Sunderland, Massachusetts. Saturday, I’ll be making the pilgrimage. 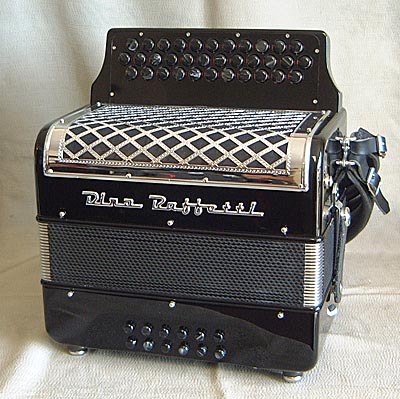 Here’s a picture of the Baffetti, and there’s a video over on the Button Box site. It’s a three-row, MM box, tuned American Tremolo (as was the Nik), with rows in F/Bb/Eb. Baffetti has a stellar reputation as a maker. As the name of the thing suggests, it was made for the Tex-Mex market, but its wider tuning perfectly suits all of the French musics I’m obsessed with. This decision has been a long time coming. I’ve loved that Nik, but have felt the redundancy of its G/C tuning many times at gigs. Also, working in a chanson trio with Barbara Truex and Joëlle Morris, the need for key flexibility is urgent. Finally, I’ve wanted a three-row quint tuned box for ages. Now I get my chance. I’m already thinking of the new possibilities for across-the-row madness and right-hand chords. Here’s hoping it all goes off as planned!